Opinion: What more can Danny Watts do to prove himself? A1 Team Great Britain team principal Katie Clements has dropped a major hint that Danny Watts could return this season, following an impressive performance in Chengdu last weekend. Watts scored a brace of third place finishes in what was his first single-seater outing in more than two years. The team is notoriously coy about their driver selection and usually only reveals its line-up at the last possible moment. However Clements admitted that Watts’ pace in China has meant that the team would be foolish not to consider the 28-year-old again. “He did an absolutely awesome job; he had the pace as soon as he went out in practice,” Clements told A1GP.com. “We were ecstatic with the results in China. Considering how late the car came together, we never thought we would ever be able to grab a pole in qualifying, and to finish with two third places meant we were a happy bunch of people. Our reaction to this is: it’s quite questionable that he hasn’t already been begged on bended knees to fill the seat in every single race for which he is available. And here’s why. Let’s just review what’s happened to Team GB over the last few months. The team finished third at the end of last season, and were therefore definitely deserving of being viewed as a title contender for 2008/09. However, like every other A1 team, they fell foul of the bid to get a completely new chassis built and ready for use by the planned season opener in Mugello, Italy, on September 21, a race which had to be cancelled outright. The series’ management had been unable to find any chassis supplier, apart from the outgoing Lola, prepared to commit to such a tight schedule and so took production in-house. This has led to a car that is much-admired by drivers and provides exciting racing for spectators – but which was barely fully ready for all the teams to run it in the Chinese round of the championship that took place last weekend. Despite being one of the top-placed teams from 2007/08, Team GB didn’t get its hands on a chassis in time to compete in the rescheduled opener – the Zandvoort round on the weekend of October 4. As a result, the points system had to be tweaked to ensure that no team was disadvantaged and now everyone gets to drop their weakest result. But the team is still carrying a residual disadvantage, despite this measure. A planned test at Snetterton also had to be cancelled and time allotted in China for testing was the first opportunity Team GBR had to actually try it out on the track. And despite this they went on to score two podiums. How? There’s a two-word answer – Danny Watts. His involvement with the series was already long-standing, having joined Team GBR as its rookie driver for part of last season and then acted as a coach to Team Pakistan’s Adam Khan – turning him briefly from a backmarker to a midfield runner. This year, he was involved in development and testing of the new car on behalf of A1GP. Thus he was able to climb straight into the cockpit in Chengdu and turn things around for the team, much to the relief of those of us who were wondering if its season would ever properly get under way. The press release quoted above highlights some of the frustrations of following the A1GP series. The pluses are pretty good – it fills a gap left by the F1/GP2 franchise in actually providing national teams for us all to cheer on, and in showcasing countries that wouldn’t usually get a look-in such as Lebanon, Mexico, Pakistan and Switzerland. And, unlike some sports we could mention, the UK isn’t embarrassingly crap at it. The racing isn’t half bad. While you’ll never replicate the spine-tingling howl of an F1 car taking to a track in anger, the A1GP machine is probably as close as you’ll get. In fact, we’ll stick our necks out and say the A1 series is a pretty good contender for next-best thing going to motorsport’s elite formula. It lacks the history, tradition and thrilling high-speed ovals of the IRL – but in their place it has a global reach and the chance to cheer on your country. Plus, this season it’s pretty easy to watch. You can get access to an impressive streaming video feed with commentary that combines the convenience of free viewing with a raw quality that’s a lot closer to being there than much of the motor racing coverage we’ve seen. But now for the big, fat minus. A1GP seems to have picked on the very worst thing of all that it could have imported from F1 – a naked commercialism which informs everything it does. This is seen in the proud announcement of larger engine covers which allow more sponsorship (but add no benefit aerodynamically), the long list of endorsements that grace the news sections of its site at the expense of more serious matters like the car build schedule, and the statements by series boss Tony Teixeira and his partners at Ferrari demonstrating how the whole thing is viewed primarily as a business opportunity. Again we ask, if that’s the case, what’s the pay-off for sports fans? What do have to gain by getting emotionally invested in it? For F1 followers, who have been seeing first-hand the pernicious effects of races being moved wherever they will raise the most cash (Valencia, anyone?) and of Ferrari seeking to safeguard its business from anything so deleterious as actually losing races, despite what’s notionally written in the rulebook, this is all tiringly familiar stuff. So we think that A1GP probably needs to decide which it wants to be – a sport or a business venture – and stop trying to have a foot in both camps. Because in pure sporting terms, the case for Team GB to have a talented British driver who can challenge for the title in that car was definitively made in China. It’s not Watts’ availability that’s at stake – later on in the aforementioned press release, he says: “My next focus is Macau this weekend in a GT race, but beyond that as far as I know that’s it for me, so I’ll just go and have a nice Christmas. Quite, Danny. We would love to be able to cheer him and the team on for the rest of the season and through a possible title chase. Why on earth might we not be able to? Is it because the Team GB seat is effectively a pay drive, and the organisers are still hoping to sell it to the highest bidder? Is it because Danny Watts, for all his demonstrable talent, is not bringing the right sponsorship or business opportunities with him? Whatever the reason, it’s hard to see how the tagline “World Cup of Motorsport” can credibly be used when sporting considerations are in danger of being thrown out of the window in this way. And it’s no use asking fans to get behind a title bid that starts out with a cancelled race, is followed up by a missed race, is then rescued through driving talent only to be put in the balance again by incomprehensible management decisions. We know A1GP is about the team, not the driver – but the other countries don’t behave this way. What about Neel Jani, Adrian Zaugg or Adam Carroll? A national team needs a national driver, or at a pinch a driver pairing, who can be an on-track figurehead and personify that country’s challenge. So we say: come on Katie Clements. 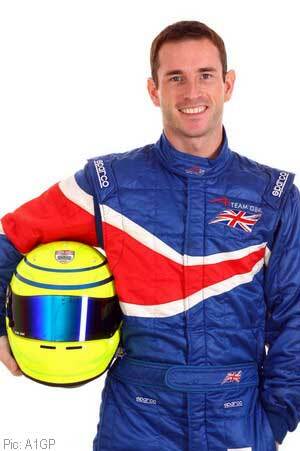 Put Danny Watts back in the car – if the constraints of the series mean that decision is in any way feasible for you. Give us something to cheer on, something we can believe in, something to be proud of, especially with the future of the British Grand Prix under threat. And please learn the lessons of F1 – that motor racing fans aren’t stupid, and they can see this kind of thing for what it is from a very long distance away. Categorised under A1GP, Opinion, tagged under A1 Team GBR, A1GP, Chengdu International Circuit, Danny Watts, Katie Clements, Sepang International Circuit.